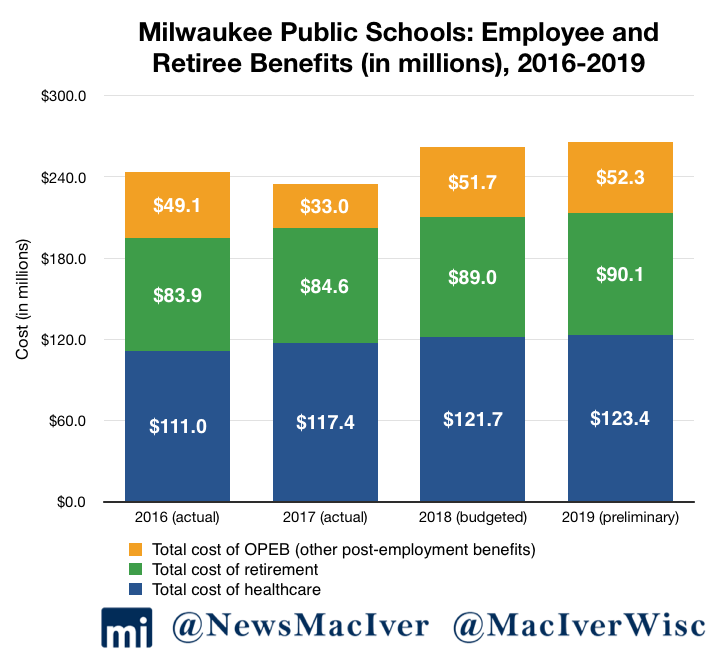 Milwaukee Public Schools plans to cut millions of dollars from its central office, while other costs continue to spiral out of control in the district’s preliminary $1.173 billion budget passed late last month on a unanimous vote by the board of education. 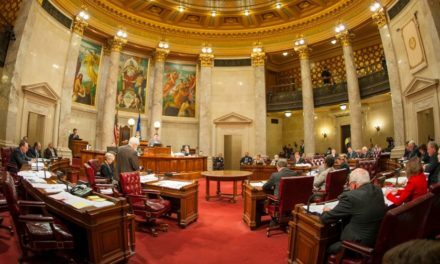 The changes follow a contentious budget debate that included one hunger strike, one “go to hell,” and many more highly reported controversies. Former superintendent Dr. Darienne Driver’s budget would have made 5 percent spending cuts to schools and 15 percent cuts to Central Office. Instead, new interim superintendent Dr. Keith Posley’s plan restructures and cuts 16.7 percent from Central Office, eliminating Driver’s proposed cuts to school accounts. Central Office is reorganized, cutting the Office of Innovation and merging its responsibilities with other departments, while eliminating almost 33 administrative roles. In addition to the administrative changes, Posley’s budget differs from Driver’s proposal in a few small ways. The plan now include 50 new full-time supplemental teacher positions, which come with healthcare benefits. The district will begin offering part-time roles for hard-to-fill positions. Twenty more school safety aide positions are added, using money from the school operations account. And in a major win for the teachers’ union – and a loss for taxpayers – 75 new “substitute teacher on special assignment” roles are created. Those teachers will also get vision, health, and dental benefits as long as they work 30 hours per more per week, which is considered full-time at MPS. The $13.2 million cut from administration amounts to a little more than a 1 percent cut from the entire budget. 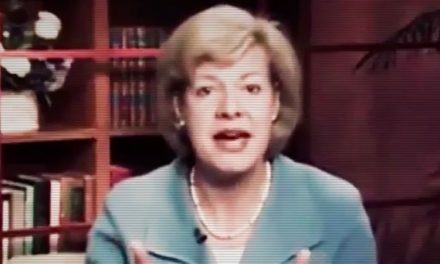 Put into a larger context, much noise was made about a relatively small percentage of taxpayer dollars. With no meaningful reform, the district does not move closer toward addressing its growing budget deficit. This detail is something taxpayers deserve to know. In the end, the budget spends $10.9 million less than the prior year. Posley’s plan spends $2.9 million more than Driver’s plan because of increased federal aids. It retains the 2.13 percent salary increases for staff, and hastens the district’s path to a $15 per hour minimum wage from five to four years. 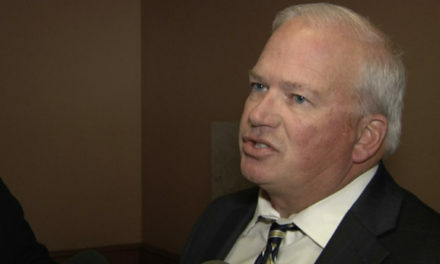 MPS’ teachers’ union, the Milwaukee Teachers Education Association (MTEA), called the budget an “amazing victory.” Union leader Alex Brower ended his 21-day hunger strike after the board voted to approve the new substitute teacher positions. Administrative bloat has been a massive driver of MPS’ budget problems for years. Many of the positions at Central Office have astonishingly high salaries and benefits packages, especially when compared to school-level positions. As the MacIver Institute has previously reported, 78 administrators at MPS’ Central Office earn an average of $111,624. Of the 336 publicly reported administrator salaries at the district, 156 individuals earn more than $100,000. Average fringe benefits for MPS administrators total $26,555. Posley’s budget cuts almost 33 full-time positions from Central Office alone, plus two more each at the Office of Accountability and Efficiency and the Office of Board Governance. However, not all of those roles were actually filled – some were vacant, with money set aside in case of a new hire. By failing to address cost drivers including MPS’ massive benefits package and its expansive, half-empty facilities, the district all but ensured the battle would continue into future years. Budget documents show the district’s projected growth in benefits spending. From fiscal year 2017 to 2022, MPS is estimated to spend 23 percent more in benefits alone, while spending on salaries and purchased services both stay close to a 6 percent increase. In its budget documents, MPS itself recognizes the structural challenge at hand. Spending on medical costs and prescription drugs is expected to grow by 5 and 12 percent, respectively. Following 2011’s Act 10, the district was able to redesign benefits packages and begin offering both high- and low-cost plans. Employees pay between 2-14 percent of their healthcare premiums, based on the type of plan they choose and how much they earn, but this is far below the 12 percent minimum set under Act 10. Should they decide to, MPS could revisit its healthcare packages once more. The district is slated to spend $123.4 million on healthcare benefits in 2019. That’s an 11 percent increase in spending since 2016. Act 10 gave them the tools to search for new healthcare providers. The question is one of will. MPS also increased the hourly threshold to receive benefits from 20 to 30 hours per week post-Act 10. Still, the 30-hour baseline is below the standard 40-hour week. For 2018-19, MPS’ fringe benefit rate totals 53.8 percent, a considerable increase from 43.2 percent in 2015-16. Clearly, despite recent changes, the district offers a considerable benefits package, both for current employees and retirees. As the number of retirees continues to grow, related line items will increase and crowd out other priorities. Spending on healthcare for retirees, which makes up much of the “other post-employment benefits” line item, has increased by almost 7 percent since 2016, adding up to $52.3 million in 2019. Budget documents show that spending on retirement has increased from $83.9 million in 2016 to $90.1 million in 2019, a 7 percent increase. That spending includes MPS’ pension plan, social security, and early retirement supplements. MPS’ own pension fund, separate from the state’s retirement system, will cost the district – and taxpayers – $39.7 million in 2019. That plan could also be ripe for reform, if the district has the will to take on the politically heavy lift. Teachers hired prior to July 1, 2013 and certificated administrators and supervisors hired prior to July 2, 2003 can qualify for the supplemental pension benefit. The program allows for early retirement once an individual is 55 or older and has worked at MPS for 20 years. Though the plan is now frozen and newer hires are no longer eligible, spending on early retirement will near $11.0 million in 2019. Spending on healthcare benefits, including medical, dental, prescription drugs, dependent care, and the health care opt-out bonus also increased in recent years. Those line items went from $110.9 million in 2016 to a projected $123.4 million in 2019. The health care opt-out bonus allows employees to receive $50 per month or up to $500 per year if they choose to use a different health insurance provider while eligible for MPS’ coverage. That benefit will cost MPS $125,000 in 2019. The opt-out bonus is an attempt to get MPS employees to choose healthcare plans outside of MPS’ system. The medical, dental, vision, and prescription coverage is generous in itself. Depending on the type of plan they select, employees can pay $20 co-pays for doctor’s office visits, $35 for urgent care or specialist office visits, and $150 for emergency room visits. In network, 100 percent of preventive care is covered. Earlier this year, Driver had proposed increasing employee co-pays and charges for dependents to use MPS coverage, but was rebuffed by the board. Under Driver’s plan, doctor’s visit co-pays would have increased to $35, urgent care visits to $50, and emergency room visits to $175. Coupled together, those changes would have saved the district an estimated $4.3 million. All of Driver’s cost-saving proposals were turned down, save one – the elimination of a long-term disability program that cost the district approximately $2 million since 2017, which just four individuals utilized. MPS also pays for group life insurance for almost all of its employees, at no cost to the employee. The current program began in 2016 and cost $537,418 in that year. For 2019, the benefit will cost $2.16 million – a 302 percent increase from 2016. Other smaller line items aren’t significant but add up over time. 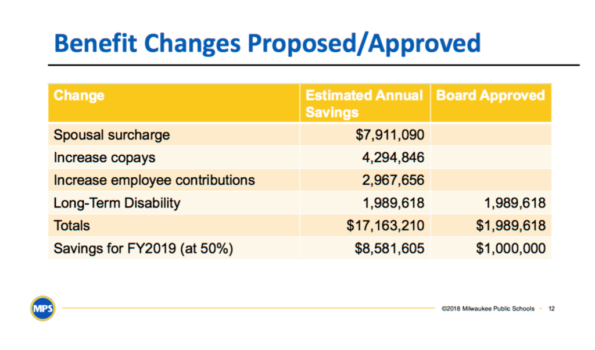 The district budgeted $380,000 for severance pay in 2019. Another $450,000 was allocated for tuition reimbursement, wherein the district pays for the continuing education of certain qualifying employees in order to promote professional growth. The new interim superintendent should be applauded for proposing long-overdue cuts from Central Office, but his changes don’t go nearly far enough to address the major challenges MPS continues to face. While much ado was made about benefits for substitute teachers, much less was made about the needs of students who continue to underperform. The needs across the district vary to a great degree. So, too, vary the needs of students. By continually trying to be all things to all people, MPS ends up underperforming for both students and taxpayers. Faced with declining enrollment and increased competition from other educational options, MPS has to face the facts when it comes to their structural issues. Left unreformed, benefits and facilities will continue to crowd out spending in classrooms. As for the 2019 budget, it will be finalized in the fall when final enrollment numbers are set. Ola Lisowski is a research associate with the MacIver Institute. This article appears courtesy of the MacIver Institute.